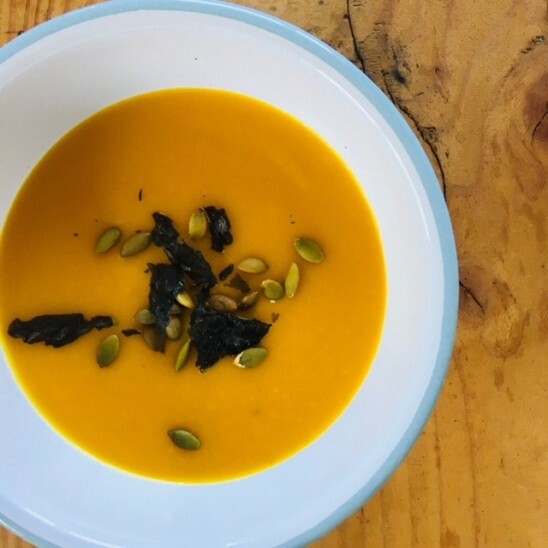 This soup is perfect for warming you up on a cold Autumn day, it’s also a very healing soup, as squash is packed with vitamin C, while the anti-inflammatory properties of ginger and turmeric aid in recovery, supporting the body in fighting any colds or flues. Peel and chop onions and add to a medium pan with a drizzle of olive oil and a pinch of salt, cook until soft, about 8-10 minutes. Peel and chop garlic, ginger and chilli, add to onions, along with the turmeric and cook off for 3-5 minutes. Peel and chop squash and apple into one inch cubes, add to onion mix, along with 300ml of the vegetable stock. Cook until soft, this will take up to 20 minutes. Once all vegetables are soften add the coconut milk, remaining stock and blend. Add extra stock if soup is too thick. This recipe will store well in a fridge for 3-4 days or you can portion it up and freeze for up to 3 months.